Recently, researchers from the Human Media Lab at Queen’s University in Canada have revealed a lightweight model atthe Tangible Embedded and Embodied Interaction conference in The Netherlands. It is called ReFlex which is built to bend as well as vibrate providing users with an improved sense of third dimension on their phones while they tend to get directions, read or play games. The phone’s basic hardware comprises of a 720p display which has been developed by LG together with a small phone processor running Android 4.4 `KitKat’. Users could bend it like a stem or tend to stretch it like a rubber band. Having a bendable phone, users could rapidly thumb through books; feel for highlighted passages or for dog eared pages. Moreover, the flexible phone could also help drivers in keeping their eyes on the road enabling the possibility of `feel’ turn-by-turn directions. With games like Angry Birds, players could also bend their screens stretching out a slingshot with vibrations which could make the phone seem like recoiling rubber band. However, the most amazing feature of the latest bendy model is that it is basically shatterproof. The secret behind the phone which is quite durable and lightweight is that the screen is plastic and not made of glass. The trade-off could be a deal-breaker in smartphone industry which has been dominated by glass screens. The phone tends to use off-the-shelf parts meaning a leap to market would not be a big jump. Professor Roel Vertegaal leading the team behind the phone comments that it is technology twelve years in the making. He further added that the phone is mass produceable as it is today. Vertegaal whose academic research had been sponsored by the Canadian government and Canadian touch tech company, Immersion Corporation will not be building a consumer phone. He states that he will leave it to the Samsung’s and the LG’s of the world. According to his estimates it would take around three to five years in bringing the tech to the market. The LG OLED display in the phone seems to be the same tech in bendable TVs and for $100, these LG smartphone screens could cost $25 more than a typical glass screen though would make the latest Android device much stronger to bend up to 40 degrees. The phone tends to be more flexible towards the centre with semi-rigid ends, where the 1,280 x 720-pixel display has a bit inferior resolution than an iPhone 6 at 1,334 x 750 pixels. ReFlex seems to utilise a Flexible OLED display from LG alike to some of the rollable screens shown recently at CES this year which enables the user to bend it as desired. It is the first flexible phone with the combination of bend input with standard multi-touch abilities which means that one could use touch interaction such as a typical smartphone and also interact with definite apps on bending the phone. 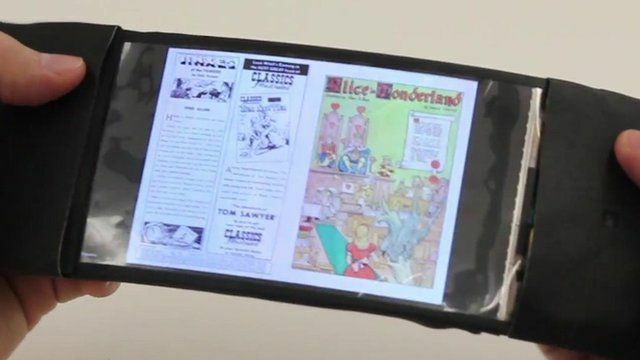 Vertegaal has mentioned that when this smartphone is bent down towards the right, pages tend to flip through the fingers from right to left just like a book. With more extreme bends it would speed up the page flips and users can feel the sensation of the page moving through their fingertips through a detailed vibration of the phone. This would enable eyes-free navigation for the user, thus making it easy to keep track of where they are in a document.